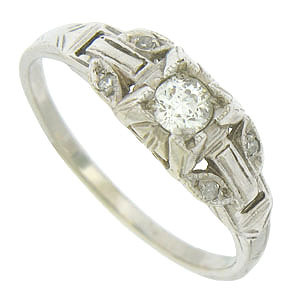 This spectacular 18K white gold antique engagement ring is set with a .19 carat, H color, Si2 clarity round cut diamond. The fiery central stone sits in a raised abstract floral mounting while bold engraved stems stretch from the rings shoulders. Pairs of leaf figures set with additional fine faceted diamonds sprout from mounting. 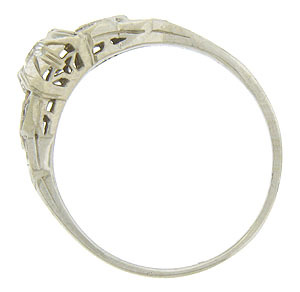 This Art Deco ring measures 6.60 mm in width. Circa: 1915. Size 7 1/2. We can re-size.